One Size Adjustable from S to L. Can be Washed and Reused Over and Over Again for Many Years! 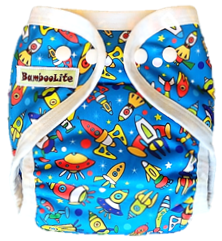 A Revolutionary, Innovative and Highly Performing Cloth Diaper with Multi-Features In One! By gathering many years of experiences and valuable customers feedback, finally we have a complete MAKEOVER to our Diapering System! Our Brand 'NEW' version of "DUO-TOUCH" Cloth Diapers! A Revolutionary and Highly Performing diaper line with Multi-Features In One! Our innovative Multi-Fit Cover features 4-Direction Leak Guard System. Leak Guard Flap at both ends prevent leaking around waist and tummy, Double Leg Gussets keep messes in and prevent leaking around legs. 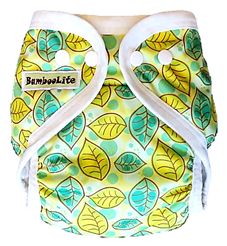 Our Multi-Fit Diaper Cover also features Soft Form-Fitting Fold Over Bindings for extra gentle fit. Unlike ordinary elastic, our gentle and stretchy bindings provide a secure, stretchy fit without leaving painful red marks on your child's tender skin! Our signature Duo-Touch Soaker features Dry-Touch and Natural-Touch options in one! The soaker comes with one side Dry-Touch microfleece to wick moisture away from baby skin, keeps baby's bottom stays dry and comfortable. And another side Natural-Touch bamboo velour is cooling and hypoallergenic, which is beneficial for sensitive skin/rash prone baby. With "duo options" built in one soaker to suit different skin types of baby, you can't go wrong! It's clevery designed to have best of both world! 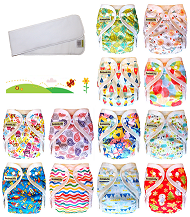 To purchase online, please click on ADD TO CART button, then choose your diaper set and print option. Cloth Diaper- One size adjustable from S to L, all diaper parts can be washed and reused over and over again for many years. It fits Baby from newborn (3.5kg) to toddler (about 3 Years old) - One size adjustable from S to L size. Usually in one whole day, you will only need 3 Waterproof Cover + 6 Diaper Soakers. Unlike the pocket and AIO diaper, the outer cover of our diaper can be reused for more than one diaper change, you may purchase extra soakers and reuse the cover. When the soaker is full (usually every 3-4 hours), you can simply change out the wet soaker and tuck in a fresh one. 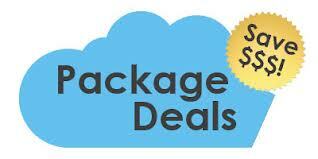 Package Deals - New to Cloth Diapers? Not sure where to start? Check out our convenient Day & Night Solution Packages, everything you need to make the switch to cloth! 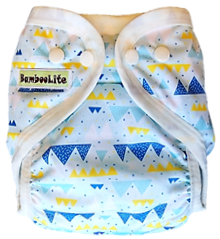 BambooLite One Size Diaper is a two-piece system (All-In-Two Diaper) that consists of a leak-proof diaper cover and a highly absorbent soaker. 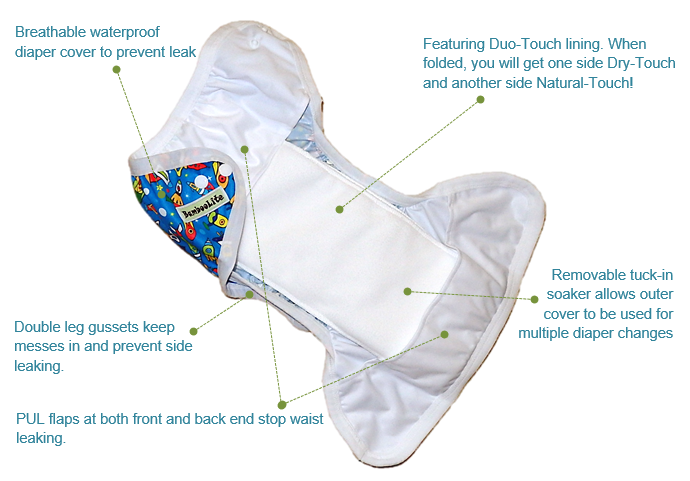 The diaper body has a waterproof layer to prevent messy leak and the inner soaker can tuck in and out of the diaper body. 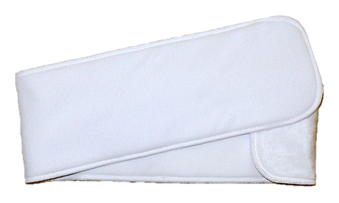 Unlike the pocket and AIO diaper, the outer cover of our diaper can be reused for multiple diaper changes. If the soaker is full, you can simply change out the wet soaker and tuck in a fresh one instead of washing the entire cloth diaper. When the diaper cover is soiled/smelly or very saturated, start with a fresh diaper cover. No Leaks & No Mess - Highly absorbent and leak-proof like disposable diapers! Highly absorbent - Only need to change every few hours for day time to keep baby fresh! Earth Friendly & Money Saving - Reusable and washable. Use-wash-reuse again and again! Safe & Healthy - No toxic chemical gel, no harmful dioxin, and bleaching agent! Soft & Irritant Free - Breathable and comfortable. No skin irritation! Fits Baby from Newborn (3.5kg) to Toddler (about 3 Years old) - One size adjustable from S to L size. No multiple sizes required. Easy to Wear & Convenient - No separate cover needed. No stuffing, just tuck in and go! Easy to Wash & Low Maintenance - Machine washable. No hassle, no fuss! Diaper Cover - 1 Waterproof Polyurethane Laminate layer. Regular Soaker (when folded) - Top Layer: 1 Coolplus Microfleece layer topped (close to skin for Dry Touch), Midddle Layers: 4 High density Microfiber Layers, Bottom Layer: 1 Bamboo Velour layer topped (close to skin for Natural Touch). Premium Soaker (when folded) - Top Layer: 1 Coolplus Microfleece layer topped (close to skin for Dry Touch), Midddle Layers: 4 High density Microfiber Layers, Bottom Layer: 1 Bamboo Velour layer topped (close to skin for Natural Touch). Small, medium or large, we have a fold-to-fit soaker to match your cover size! 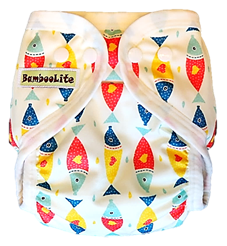 BambooLire Duo-Touch Soaker is a Foldable One Size diaper soaker designed to provide perfect fit on multiple sizing of diaper cover. 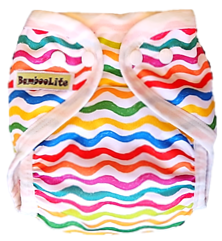 This highly-absorbent soaker features half layer of organic bamboo velour and half layer of stay dry microfleece lining. When folded, you will get one side Dry-Touch and another side Natural-Touch. 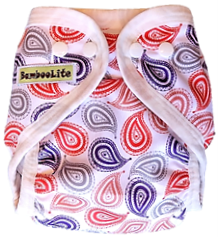 Dry-Touch fabric wicks moisture away from baby skin, keeps baby's bottom stays dry and comfortable. Natural-Touch fabric made from cooling and hypoallergenic natural fibres which is beneficial for sensitive skin/rash prone baby. With "Duo Options" built in one soaker to suit different skin types of baby, you can't go wrong! It's clevery designed to have best of both world! Regular Soaker (when folded): 6 layers (1 layer of Coolplus Microfleece + 4 layers of High density Microfiber + 1 layer of Bamboo Velour). Premium Soaker (when folded): 8 layers (1 layer of Coolplus Microfleece + 6 layers of High density Bamboo Cotton + 1 layer of Bamboo Velour). Featuring Duo-Touch lining. When folded, you will get one side Dry-Touch and another side Natural-Touch! For largest size, simply fold the soaker into half. For smaller size, fold shorter at one end to achieve the size to match the diaper cover. It is now ready to place in the diaper cover. Slim, chunky, tall and short, we've got your baby covered! 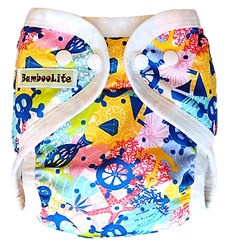 BambooLite Multi-Fit Cover is a versatile Adjustable One SIze diaper cover designed to provide a great fit on multiple stage of babies from 3.5kg to 16.5 kg. 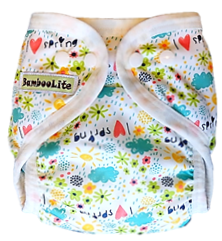 3x3 Snap Down Sizing System at the rise and multiple snap positions at the waist allowing them grow with your baby - from infant to potty training. 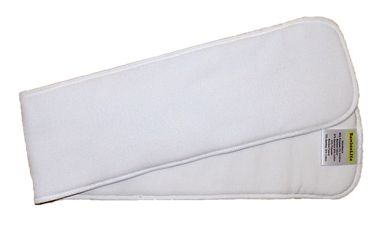 This highly-protective diaper cover features 4-Direction Leak Guard System. Leak Guard Flap at both ends prevent leaking around waist and tummy, Double Leg Gussets keep messes in and prevent leaking around legs. With all these protective "fences" built around the diaper edges, no matter how your baby toss and turn, you can rest assured no messes will escape out of the cover! It's simply the best to keep everybody peace of minds! Instead of using ordinary elastic, our Multi-Fit Diaper Cover uses latex-free soft form-fitting fold over bindings for an extra gentle fit. Gentle and stretchy bindings provide a secure, stretchy fit without leaving painful red marks on your child's tender skin! - 1 Waterproof Polyurethane Laminate layer with 4 leakguards. HOW TO USE CLOTH DIAPER? 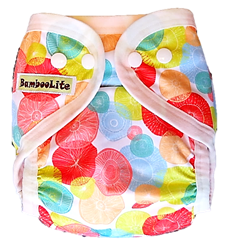 Using BambooLite cloth diaper is just as easy as disposable diaper. 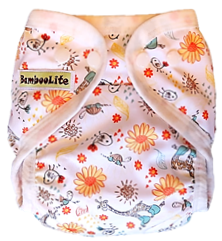 Our cloth diaper is fitted with snug and super-soft binding around waist and leg and have easy snap closures. It is leak-proof and very absorbent, you will only need to change every 3-4 hours for day time. Tuck the soaker to diaper cover. Put the cloth diaper on baby, and you are good to go until it's time to change! When the soaker is full, you can simply change out the wet soaker and tuck in a fresh one. You may get some extra soaker if you want to reuse the diaper cover. If you want to add on booster for extra absorbency, Booster can be added on to increase the absorbency. After used just keep them in a covered pail or waterproof bag until washing time. You do not need to rinse the used diapers when you are away from home. You can just rinse and wash it at the end of a day. One short cycle of rinsing without detergent + one long cycle of washing with detergent, that's all. Cloth Diapers can be washed easily in the washing machine. Laundering diapers is just as easy as laundering your regular clothes, but there are a few extra steps you’ll need to take. Just a little bit more, don't worry, it is easy! Dispose-off any solids on the diaper into toilet. Rinse the solid waste out of the diaper with clean water. Remove the soaker/booster from the diaper cover. Sort delicate items or those that contain PUL, elastic and snap into laundry net. Washing with laundry net is highly recommended! Dump your dirty diapers into the washing machine. Make sure not to overload your machine. Preferable not more than 20 sets per load. Do a quick pre-rinse cycle: run a shortest laundry cycle without detergent to get the nasty out prior to the wash cycle. Do a complete wash cycle: once the pre-rinse cycle is completed, follow by a long laundry cycle with detergent. Hang/line to dry. Always place the inner side of the diaper facing the sun to avoid color fading. Diaper ni sangat best! Material pun best! Double gusset and elastik binding yang lembut, design pun nampak kemas dan slim. Kain PUL yang berkualiti & lembut. Baby nampak sangat selesa. Serapan superb! Serapan 12jam malam, 6jam siang untuk anak saya yang setahun lebih. Langsung tidak sama dengan cloth diaper yang harga ekonomi(murah), berbaloi walaupun bayar lebih sikit! I love the fit of this diaper! Nothing else compares! Great fit without leaving painful red mark like other brand diapers! The quality of this diaper is very good. I am buying more of these diapers to fill the rest of my stash. Flexible hybrid system with good performance, comfort, and ease-of-use. Very good quality of materials, workmanship and clever design! It’s Worth the Price! Once you try this brand, you can't go back to the economy CD range! Great value, great construction, easy for first-time cloth diapering. I am a cloth diapering newbie, and I did a lot of research before my son was born. So I looked at reviews of all the diaper covers before deciding to try this one. I LOVE IT! The gussets on the sides contain everything. For the price, these diapers are VERY well made. I was impressed. The cover doesn't have to be washed after every usage. I just rotate them every other change. If anything gets on them, I just wipe them down and air dry. By the next diaper change, the other has dried and is ready to go. Very flexible! I am so glad I gave these a try. They have a nice fit and hold in leaks well. Great diaper, the first diaper that don't leave a deep red marks on her legs! I really like this diaper. Good quality diaper! Holds quite a lot of wee for my 5 month old son. It fits really well and holds everything in. Great sizing and leak free! I love the prints too, so cool! I am absolutely in love with the idea of "Duo-Touch Soaker"! I have a 2 years old girl, and a 3 months old boy. They react to diaper material differently. It is a biggest headache for mummy to get a diaper that suits both! Seriously, I do not want to invest in 2 different types of diaper, it is wasting money. I saw BambooLite diaper came with "duo options" built in one soaker to suit different skin types of baby, I grabbed one to try out. I am using stay dry side on my toddler girl, and bamboo velour side on my super sensitive baby boy. And it really works! I will surely invest more on this diaper, I can rest assured that after my girl potty trained, the diapers can be fully passed to her little brother!